Like a preening Texas cowboy strutting his stuff on a barroom dance floor, the testosterone-stoked little guy is doing his best to attract a cute hen. His neck sac is inflated like two orange balloons; he's stamping out a steady drum roll with his feet, extending showy feathers over his head, puffing up his chest, throwing back his wings and letting loose a mesmerizing booming sound. 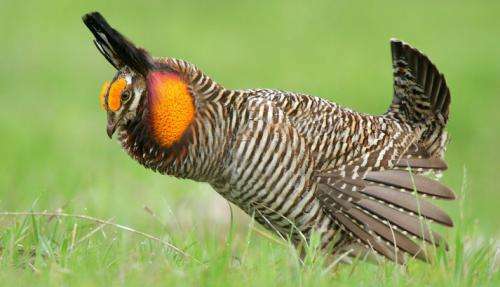 But what makes the Attwaters prairie chicken's mating ritual all the more imperative is that it also represents a last dance by a bird on the edge of extinction. This spring, only 66 Attwaters remain in the wild on two Texas preserves, said Terry Rossignol, recovery team leader for the U.S. Fish and Wildlife Service, which manages the 10,528-acre Attwater Prairie Chicken National Wildlife Refuge 60 miles west of Houston. There are 58 Attwaters there and eight at a small private area near Goliad. And those numbers are up from last year, when the drought-devastated population plunged to 46. At Fossil Rim Wildlife Center near Glen Rose, the randy 2-year-old bird is doing his part to help save his species as one of 24 breeding pairs of Attwaters in the center's captive breeding program. The eggs and chicks they produce will be treated like treasure over the next four months as part of an effort to pull the endangered species back from the brink. Since 1992, Fossil Rim's captive breeding program, the first of its kind for Attwaters, has produced 6,456 eggs and raised over 3,800 chicks, avian curator Janet Johnson said. Many of the chicks fail to thrive in their first days, and others succumb to illness and injuries later, she said. In 21 years, about 1,200 have been released back into the wild. Fossil Rim, a nonprofit conservation facility, is known as a drive-through sanctuary where animal lovers can view 50 exotic species like giraffe and zebras from their cars along nine miles of open grasslands and wooded hills. Other than a handful of older birds at the center's children's animal center, the Attwaters are kept sequestered. The chicks in the incubation center can be checked out by visitors who pay $52 a person for behind-the-scenes tours. Fossil Rim is active in breeding programs for other endangered animals like cheetahs and black rhinos. But the center's most critical conservation work may be its effort to help save the Attwaters, said Kelley Snodgrass, director of animal care and natural resource management at the 1,700-acre natural zoo. "Cheetahs and rhinos are the big sexys - they are the iconic species that people gravitate to," he said. "But at the same time, here we are sitting in Texas with a bird that is on the brink of extinction right here in our backyard that not many people know about." Fossil Rim first planned to work on a breeding program for greater prairie chickens, but the Attwater's population was crashing so fast that something had to be done, he said. "We dove in; we couldn't wait," Snodgrass said. "It was a steep learning curve. It really took off in 2005 and each year we learn more." Fossil Rim has a cost-sharing program with the Fish and Wildlife Service to fund the program. "If we spend $2, we get back $1 up to a certain amount. The rest comes from revenue generated by the park," he said. A little over a century ago, more than a million of the football-size Attwaters could be found along a 75-mile-wide band of coastal prairie stretching from Corpus Christi to southwestern Louisiana. But loss of habitat devastated the species, and by 1919, Attwaters had disappeared in Louisiana. Texas ended hunting for the birds in 1937, and the species was listed on the federal endangered list in 1967. Only a few hundred remained in the wild when Fossil Rim got involved, Rossignol said. "If it had started just a few years later, there probably wouldn't be any Attwaters today. That's how close we were to losing the species," he said. "It gave us just enough time to figure out the techniques and start increasing them in captivity. Fossil Rim's work was crucial." A few years later, the Houston Zoo started a breeding program and zoos in Abilene, Tyler and San Antonio are now participating. SeaWorld of Texas is "taking a different swing at it," testing artificial insemination techniques, Rossignol said. Over the past three years, the programs contributed 170 to 175 birds annually to the wild. Another limiting factor keeping Attwaters on the brink is that chicken is what's for dinner on the prairie, Rossignol said. "Fifty percent of the birds won't live each year. That's normal. They are the food source for all the critters," he said. New enemies - fire ants - have become competitors for the insects that chicks rely on for food. In captivity, one Fossil Rim bird lived to be nearly 10, but after five years they are phased out of the breeding program. But even the elderly birds keep dancing during the mating season. The season's first egg arrived in the Fossil Rim incubation room March 27, but with 24 hens each producing a clutch of about 15 eggs over two weeks to a month, things are getting hectic in the breeding center. Johnson, avian care specialist Cara Burch, three interns and the center's two staff veterinarians are providing nearly round-the-clock attention to the eggs and then the chicks. Burch says the nervousness never ends when handling such rare specimens. "There's only about 300 of these birds; that's why every egg, every chick and every bird is so important," she said. The breeding pairs of Attwaters are matched by something akin to a genetic dating service by a "stud-book keeper" at the Houston Zoo, Johnson said. The open-air pens are ringed by electrical fencing to keep out other critters. To minimize dangers like bad weather, each egg is removed from a hen's pen after it is laid and replaced with a "dummy egg" - an infertile Attwater's egg filled with plaster of Paris. "That way she doesn't get frustrated; she still feels like she laid a full clutch," Johnson said. Domestic chickens have recently started participating in the process. Small bantam brood hens take over egg-sitting duties from their wild cousins for seven to 10 days when possible. "For whatever reason, they tend to produce a stronger embryo," she said. Incubation takes 26 days and once hatched, the chicks are fed a formula of pelleted food developed by the Fort Worth Zoo that replicates their diet in the wild, Johnson said. Of 300 eggs, about 260 are usually fertile, but once they are hatched is when things get dicey. "The biggest challenge is keeping them alive for the first seven days. After that, we're gold," said Johnson, who has overseen the program since 2001. "We don't have the answer for their mortality. That's the great unknown." In late July through September, the radio-collared birds will be released to the refuges in multiple stages, Johnson said. In the wild, the Attwater's mating dance is a force of nature, Johnson said, with 12 to 15 roosters booming and stamping their feet to attract suitors. "A hen then decides she likes how this one sounds, or this one dances. We don't know what she is looking for, but she has choices," Johnson said. She added: "The only thing the rooster is there for is the deed. Sort of like a Texas barroom." Hopefully, the dance floor will get a little more crowded, Snodgrass said. "Attwaters aren't thriving in the wild but we are getting there. We're finding the keys to keeping them alive." This 10,000 acre refuge has been in operation for 41 years and only has 58 birds to show for it??? That's gotta be about $12B spent per bird. Either 1) the management of the refuge is near-100% incompetent, or 2) the bird is simply not suited to survive, or 3) both 1 and 2. This is what happens when you put enviro-emo liberals in charge of other people's money. "In 21 years, about 1,200 have been released back into the wild." I am curious from where you pulled that $12B number. I took my gut feelings and made an educated guess - based on experience with other governmental fiascos - then divided that number by 9. I may be off by a few B either way. Bottom line is 58 live birds to show for 41 years of effort and a boatload of money. Only the most foolish of liberals would consider this a success. What government fiasco? Read the article. Who is doing the conservation? Of the seven or so listed parties, only one is a federal agency. The article focuses on the activities of a nonprofit. It's mentioned that they are partially supported by federal dollars, but most of their support is by other means. I don't think much of the education that led to that guess. Were you one of those kids who sat in the back row tossing spitballs while the rest of us were learning reading comprehension? I applaud them and their work. however, based on the fact they can keep breeding stocks supplying new chicks for years in captivity it seems to me it should be "nearly extinct in the wild." "This spring, only 66 Attwaters remain in the wild on two Texas preserves, said Terry Rossignol, recovery team leader for the U.S. Fish and Wildlife Service, which manages the 10,528-acre Attwater Prairie Chicken National Wildlife Refuge 60 miles west of Houston. There are 58 Attwaters there"